Now available, the 2016-2017 UC Santa Cruz Campus Food & Garden Guide offers a cornucopia of internships, classes, grants, workshops, and volunteer options for students who want to get involved in sustainable food systems, from learning how to grow their own food to shaping policies for sourcing food served in the dining halls. 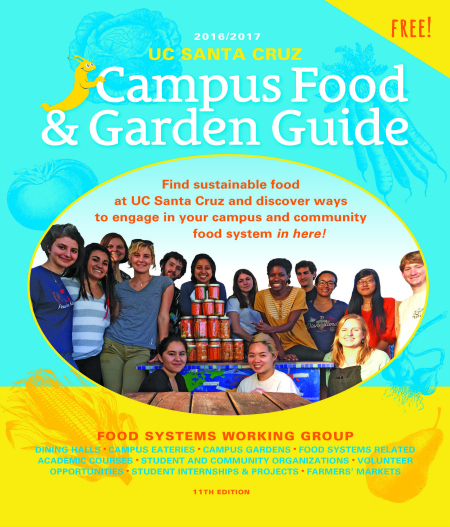 Produced annually by the UC Santa Cruz Food Systems Working Group and the Center for Agroecology & Sustainable Food Systems (CASFS), the printed 48-page guide brings together information on the many campus organizations involved in food systems work at UCSC. Readers can also learn about the history of farm-to-college work at UCSC, the new Global Food Initiative Fellowships, Measure 43 funding for student projects, Food Systems Learning Journeys offered throughout the year, and the campus’s “Real Food” goals. Free copies of the Campus Food & Garden Guide can be found at campus libraries, Bay Tree bookstore, Cowell Health Center, Student Union, campus dining halls, and other sites throughout campus. A pdf of the printed guide is also available online at http://casfs.ucsc.edu/farm-to-college/cfgg-16-17.pdf.